According to the Safe Kids USA, children are twice as likely to be killed by a vehicle on Halloween compared to other days of the year. Share and keep in mind these tips for safe driving. 1. Yield to Trick-or-Treaters: Be prepared for children to run into the street at any time. 2. Refrain From Passing Idle Vehicles: You never know when the driver in front of you has stopped to drop children off. Be patient and take extra caution when traveling near other vehicles. 3. Park Your Mobile Phone: With children crowding the dark roads, it is especially important to avoid any distractions while behind the wheel. 4. 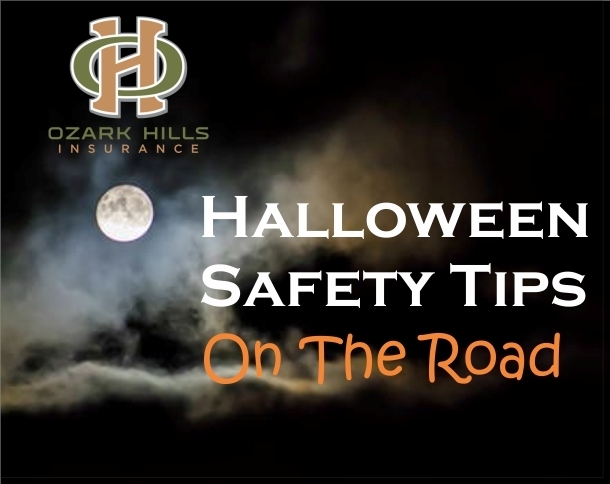 Communicate With Other Drivers: Use hazard lights when picking-up or dropping-off trick-or-treaters. Always use turn signals. 5. Consider Alternate Routes: Avoid driving near trick-or-treaters by taking routes that go around busy neighborhoods, not through them. At Ozark Hills Insurance we care about the communities we serve. Please share this list of driving tips to build awareness for safety especially for our children.